In situations where there is available “run-out” space beneath a rockfall barrier in which the rocks can ultimately stop or be collected harmlessly. Hybrid and Attenuator Systems combine the energy absorption capabilities of a dynamic rockfall barrier with the reduced maintenance advantages of drapery mesh on slopes. The attenuator or hybrid fence is a system which combines high dynamic impacts when the rock hits the nets and guides the rock down to the end of the drape but does not stop them. Rotational energy of the rock is high in terms of total kinetic energy in this instance unlike in the free falling situation. Thus, the governing criteria is therefore the resistance of the net at the time of impacts to minimise damage due to the slicing forces resulted from the rolling and bouncing effects of the rocks from up slope. Due to the difficulty in maintenance and hence high cost for these hybrid fences, the high resistance of the panel will be the most important consideration. The Maccaferri rockfall hybrid and attenuator barrier systems supplied by Geofabrics combine the energy absorption capabilities of a dynamic rockfall barrier with the reduced maintenance advantages of drapery mesh. In full scale tests conducted by Colorado DOT (Arndt, B., Ortiz, T., and Turner, A., 2009. Colorado’s Full-Scale Field Testing of Rockfall Attenuator Systems. Transportation Research Circular E-C141, Oct, 2009) stated that the Maccaferri attenuator with HEA cable net panel with knots “withstood impacts with the least amount of damage after repeated impacts” compared to the 10 other systems in the test. Unlike the majority of controlled rockfall mitigation system field tests that have been conducted in the Europe, they have been limited in the respect that they only capture the translational movement of a falling rock. The CDOT field test study provided a unique opportunity to assess the durability of these devices when impacted by test rocks with a rotational component and therefore more realistic. The CDOT transport research circular also provided some comments based on the experience from previously installed attenuator fences at the area and observation of results from the recent rock-rolling trials. The suspended attenuator panels and support components to be effective are constructed of materials that are sufficiently rugged to accept multiple, near-simultaneous, impacts without excessive loss of suspended height or compromised capacity. The higher density/m² panel appears to be performing better than lighter products. Cable rope panel with double wrapped wire connection performed the best among others. Maccaferri Hybrid and Attenuator Systems are used in passive rockfall hazard mitigation slowing the momentum of the rock. 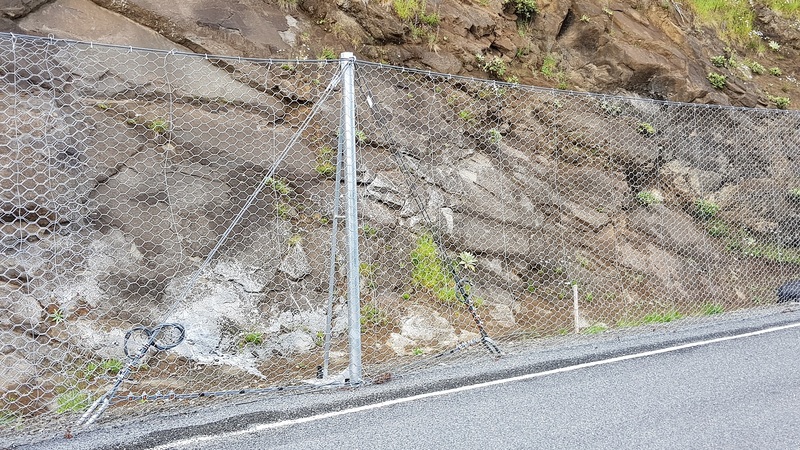 Rather than being secured to a lower support cable, the fence mesh is longer and drapes down the slope where it is able to slow the descent of falling rocks. Custom made item specific to site conditions and installed by specilist contractors. Please get in touch with our team for design suggestions and support.